It’s a fact; customers are drawn to a good brand story. C’mon, you can’t deny that you’ve fallen prey to buying a product because you fell in love with the brand and wanted to be a part of their story. When leveraged in the right way, brand stories can be incredibly impactful and encourage customers to form a connection with your products. Where better to support that connection than directly on the product page? You may be thinking to yourself, ‘isn’t the primary purpose of a product page to push product and convert sales?’. Yes, but it’s also the perfect point in the purchase process where the customer needs that extra knowledge, connectivity and interactivity with the product before deciding to invest in your brand. The following points provide insight into how you can leverage your product pages to better convey your brand story. Educated customers are confident buyers. It’s likely you’ve experienced the try-before-you-buy mattress buying process at least once in your life. Whether you were weirded out by the countless amount of germs left behind by other buyers or annoyed with the pesky salesperson who watched your every move, the experience was probably less than optimal. Casper, a popular consumer product eCommerce company, hopes you can sleep away those horrible memories on their mattress-in-a-box solution. But how does a company like Casper gain customer trust and buy-in on a entirely unfamiliar eCommerce buying experience? I mean come on, how can you consciously spend $800+/- on a mattress that you’ve never tested, that ships to you in a box? Furthermore, how does Casper set themselves apart when many other companies like Tuft & Needle, Lessa and Yogabed are jumping on the bed-in-a-box bandwagon? The answer is in Casper's uniquely branded educational experience for the buyer right on their product page. A playful, full-width image displaying a '100 night trial, free return pickup' call-to-action immediately establishes a sense of trust between the brand and the buyer. Although purchasing a mattress online may not be what we’re used to, Casper is confident enough in the quality of their product to offer their customers a 100 night trial period to experience their mattress before making the decision to keep or return it. Casper also takes the time to visually guide the customer through the thought process that went into the design of their product. 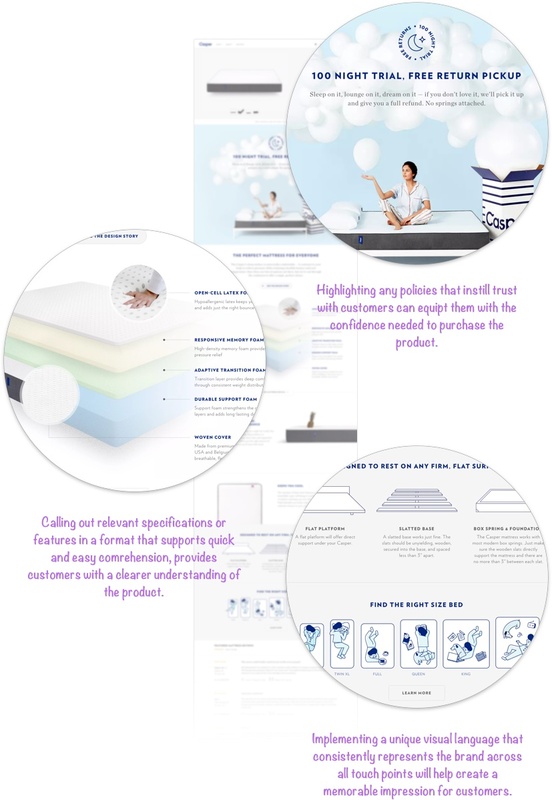 This detailed mattress breakdown not only provides a higher level of understanding of the product, but it also conveys the brand's high level of transparency. As Casper continues to compete in a hyper-competitive market, any advantage over their competition can make a huge impact. Casper wraps up their product page with a simple educational illustration depicting mattress size. This is where Casper’s attention to brand detail across multiple platforms comes into play. If you’ve stumbled upon one of Casper’s commercials, you’ll notice a familiar sense of wit, charm and illustration style—consistent with the brand’s visual language used across their website. By utilizing a consistent voice across multiple channels, Casper encourages customers to form a strong sense of brand recognition. Leverage social media to reach more customers. If you’ve ever taken a look around any local coffee shop you've probably noticed a majority of people glued to their phone, tablet or laptop. I think it’s safe to say that they were not writing their next Pulitzer-prize-winning novel. Instead, they were likely enthralled in the latest happenings unfolding on one of their many social media accounts. 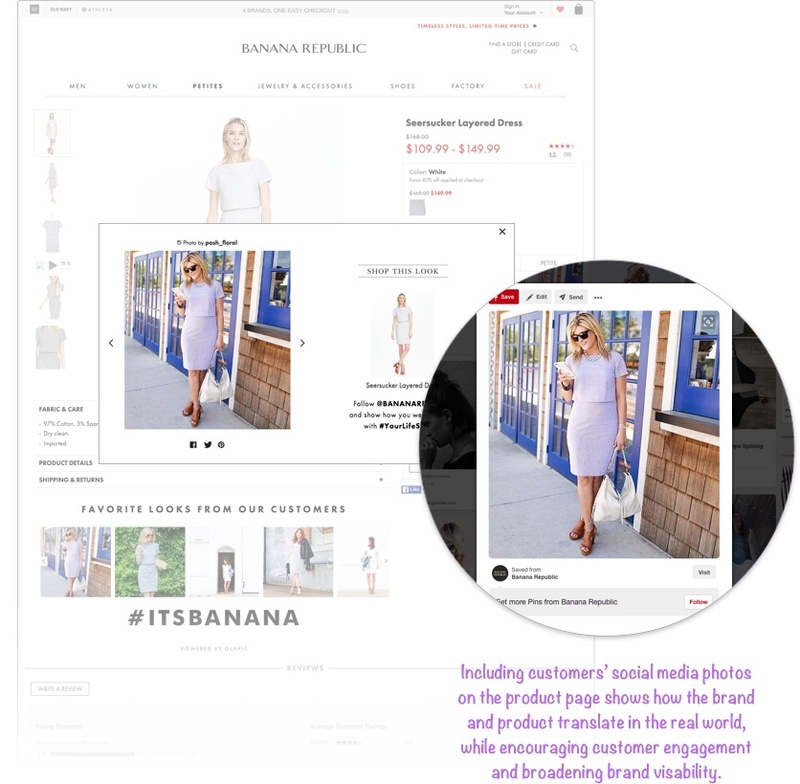 In-store and online retailer, Banana Republic uses this to their advantage by leveraging their customer’s social media power to enhance and promote their brand online. Because what better way to grow your brand than through an Instagram posting, Pinterest pinning, satisfied customer base? A curated gallery of Instagram follower photos accompanies every product page under a ‘Favorite Looks from Our Customers' header. In viewing this gallery, the customer can gain a better sense of what the clothing looks like in a real-life setting when it’s not being sported by an airbrushed model in a perfectly lit room; which is often the case for most retail product shots. Additionally, these curated photos successfully convey the simplistic, sophisticated, and modern lifestyle of the brand while using the social media language that their customer is familiar with. Banana Republic also does a great job of encouraging social interactivity across various platforms with social media sharing options once a customer clicks on a ‘Customer Look’ photo. Just imagine the endless possibilities for a brand to evolve and grow with the pin of a single ‘Customer Look’ image, that turns into millions of repins, which increases traffic to that product and ultimately results in a significant sales increase! Genius, if you ask me! Engage customers with real-world examples. It’s true; there is a certain feeling that comes from going to a store, picking out an article of clothing, trying it on, spinning and twirling in the dressing room mirror to see how it fits, and ultimately deciding to make its purchase. The challenge for many retailers is capturing this in-store experience and successfully conveying it online. Lululemon, an in-store and online retailer of high-end athletic clothing, strives to bridge this experience gap by encouraging customer engagement online. One of the biggest challenges for online shoppers is determining what size they need to order, especially when it comes to athletic clothing. 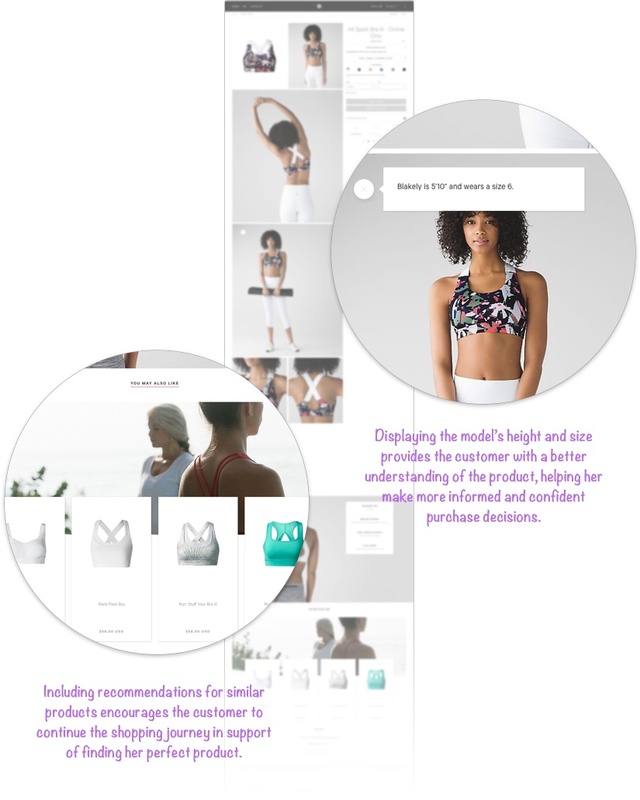 Lululemon goes a step further than the usual size chart and provides an interactive tooltip overlaying the product image that contains the measurements of the model and their corresponding Lululemon size. This provides a visual representation for the customer to compare themselves to and determine the right size for them. Not only does this help to make the buyer’s experience easier and more enjoyable, but it also encourages them to interact with the brand. 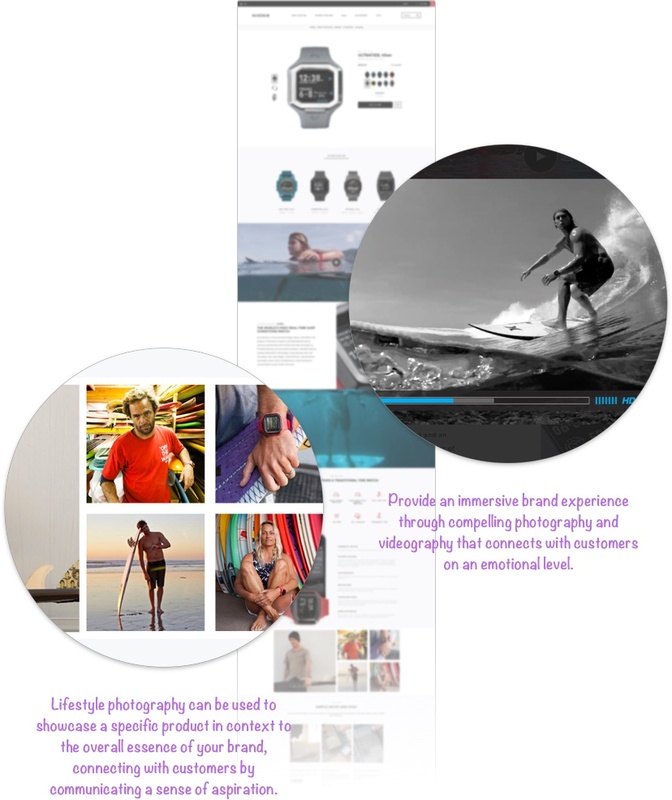 Lululemon also encourages the customer to explore more products with their ‘You May Also Like’ section. This shows a determination to assist their customers in finding exactly what they’re looking for. Furthermore, this area reiterates the essence of the Lululemon brand by accompanying the product recommendations with an inspirational lifestyle image. These seemingly subtle instances of recurring brand elements add up to create a cohesive, distinct, and memorable impression for the overall brand experience. Let the lifestyle content do the talking. It’s no secret in our office that our creative director, Aaron, is a diehard surfer. While I have no experience in the matter, there is one thing that I’ve learned—surfing is not a hobby; it’s a way of life. Nixon, a premium watch and accessories company geared toward those sea-loving surfers, aims to capture that lifestyle while selling their Ultratide, 45MM watch. But how do you go about selling a product, a lifestyle and a brand? Sounds like a challenge, right? Nixon answers this question by pairing compelling videography, showcasing beautiful visuals of memorizing swells, intricate coral reefs, and crystal clear water, with facts about their Ultratide watch right on the product page. The striking camera angles and melodic music combine to make a high-quality video that is uniquely ‘Nixon’. This uniqueness and attention to quality can be experienced in their products. Without a single spoken word, this video engages the customers on a whole new level. As customers continue to browse the product page, they’re engulfed in the brand experience through full-width, beautifully shot lifestyle photography. It can be fairly common practice for product pages to solely feature silhouetted product shots, but by providing inspirational lifestyle photography a brand can breathe life into a product, creating a truly immersive experience for the customer. In Nixon’s case, written content takes a back seat to the visuals, who do most of the talking for the brand. After all, they say a picture’s worth a thousand words—I’d say they’re right. Provide educational opportunities through well-crafted content, infographics, and illustrations to encourage customers to learn more about your product and become invested in your brand. Encourage the participation of your customers through your social media platforms to expand your marketing reach and become a recognizable brand. Create unique online experiences that encourage customers to interact with your brand to gain a better sense of brand values and goals. Showcase a mixture of compelling videography and photography that capture the essence of your brand look and feel to create a truly immersive experience for the customer.